Bamboo. It's as green as grass. In fact, it IS grass, and that's part of what makes it "green" or environmentally friendly. 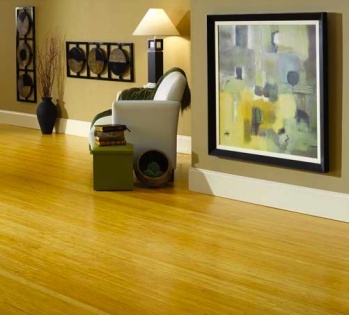 Bamboo flooring actually comes in many different colors. So what makes it greener than other flooring options? Well, it is an extremely fast growing grass that can be harvested after three to five years of growing from mere sprouts. This allows for much faster harvesting cycles than hardwood, and much more flooring can be produced per acre. On top of that, when bamboo shoots are cut, the roots remain intact, and new bamboo begins to grow in its place without any additional land cultivation. It also requires minimal fertilization to grow, and its dense root masses help prevent soil erosion. Bamboo is manufactured from strips of the cane that are compressed into planks, which are very similar in look and performance to regular hardwood floors. These planks can then be installed in the following ways: glued, nailed, or floated. 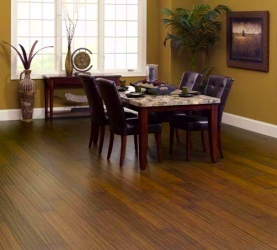 Bamboo offers the beauty and warmth of a wood floor at a lower cost to you and to the environment. Bamboo flooring is hard and durable. Its hardness is in the range of harder than red oak and maple to slightly less, depending on the grade and type. Bamboo flooring lasts a long time when properly installed and maintained.